Foodiva's Kitchen: The Brangelina of Polvorons - Blackberry, Black Sesame, Coconut-Lavender and Raspberry. Also Giveaway! The Brangelina of Polvorons - Blackberry, Black Sesame, Coconut-Lavender and Raspberry. Also Giveaway! About a month back, I introduced you to the joys of Polvoron, a crumbly shortbread widely enjoyed in Spain, Mexico, Argentina, and the Philippines. It's crafted with milk powder, butter, flour and sugar, and delicious when eaten with coffee, tea, or alone as a snack. On my last post about these delectable little sweets, I added three different ingredients as flavorings - matcha (green tea), chocolate and red dragonfruit. This time round, I wanted to experiment a bit more with other flavors and came up with these winning 4 (or 5): blackberry, raspberry, black sesame and a combination of coconut and lavender. I'm not ashamed to make this confession - I prefer making polvorons to macarons. Like good guys vs. bad guys, the former's more reliable, no eggs need to be aged, no ovens need to be turned on, you can make them whether rain or shine and best of all, no tearing-out-hair sessions need occur when the feet don't form. Polvorons, in fact, don't have feet and always turn out the way you envisage them to be! As I also mentioned previously, polvoron molds (with the plunger) are hard to come by where I live. If I hadn't been scouring our speciality baking supplies shop looking for other things, I would never have found my tiny, round mold. Then a few days ago, I was in a regular grocery store looking for well, groceries when I came across a wall of cookie cutters that I had not seen before. They were not metal but reasonable-priced plastic cookie-cutters, but by golly, several had plungers attached to them! My mental lightbulb came on and flashed up "P-O-L-V-O-R-O-N" in some sort of psychological morse code. See, plastic cookie-cutter... attached to a very useful plunger! And so my polvoron adventure continues. I was quite happy with the flavors and equally ecstatic that the makeshift polvoron molds worked really well. Can you see how lovely the shortbread flowers came out below? If you were to eat them immediately after they were released from the mold, the polvoron would be fragile and very crumbly. To firm them up a bit, I de-molded them straight onto a plate or tray and placed them in the fridge for about 10 minutes. After that, they can be handled easily without cracking or crumbling back into powder in your hands. The trick is to mix a batch of the dried ingredients (flour, milk powder and sugar) first in a big bowl, then divide them up into smaller portions for the addition of the individual flavors. Ideally, the flavoring should be in powder form but I'm not really a fan of processed food (well, except for the flour, milk, butter and sugar! ), so for the fruity flavors, I simply used fresh raspberries and blackberries. I only needed a few pieces of each and blended them together with the melted butter required to bind the shortbread together. If you are keen to try out my polvoron recipe, you needn't fret about having to hunt down special polvoron molds because I have two extra ones to give away. A lucky winner will receive both the flower cookie cutters that I've used here, and yes, it's open to everyone! I want you to also have your own polvoron adventures ;-). Oh, and share them with us, of course. 1. Leave a comment on this post. Whatever it is, you'll be automatically entered for the draw. 2. If you're not already, follow Foodiva's Kitchen and let me know in the comment that you've done so. 3. Follow me on Twitter @Divababu. 4. Follow me on Pinterest @Divababu. Split your comments if you're doing more than one of the above as they count as extra chances in the draw. This giveaway period will carry on until midnight 15th June 2011, after which I shall announce the winner. I entered my previous polvoron post in the Your Best Recipe (May) event hosted by Nancy of Spicie Foodie. If you haven't already checked out all the brilliant entries, click here and prepare to be gobsmacked! 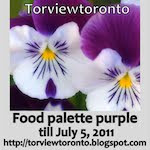 Update: This post is also linked to Torviewtoronto's Purple Food Series Palette event below. Thanks for hosting, Akheela! 1. Sieve the flour into a thick-bottomed, non stick pan and toast on medium heat, stirring constantly, until flour turns light brown (10-15 minutes). Transfer the roasted flour in a bowl right away to prevent further cooking. 2. Add powdered milk and sugar into the mixing bowl, stir to mix. (Add flavoring at this point, if you are using). Then add the melted butter, mix with a spoon and press the flour to ensure there are no lumps. 3. Take the polvoron mold, fill it with the polvoron mixture by pressing down on the flour until it is fully filled. Press down hard to compact the mixture before releasing it from the mold. Add more butter if the mixture in not cohesive enough. Place on a tray and leave in the fridge for 15 minutes to firm up. 4. Carefully wrap a polvoron in cellophane or colored Japanese paper. Store in an airtight container. 5. If you want to try the different flavorings, divide the polvoron mixture above into 4 portions (approximately 150g dry mixture each, before the addition of butter). Blackberry polvoron - Blend 5-6 blackberries with 1/4 cup cooled melted butter, then add to the dry ingredients and mix. Black sesame polvoron - Add 3 tablespoons of black sesame powder to the dry ingredients before adding 1/4 cup cooled, melted butter. Mix until well incorporated. Coconut-lavender polvoron - Grind 2 tablespoons dessicated coconut with 1/2 teaspoon dried lavender until it becomes a fine powder. Add this to the other dry ingredients, then mix in 1/4 cup cooled, melted butter. Raspberry polvoron - Blend 7-8 raspberries with 1/4 cup cooled melted butter, then add to the dry ingredients and mix. wow what an unique treat..wonderful Maya! Those are adorable!!! Hi Sandra, you're the first one entered for the giveaway! Sweet comment, as always ;-). Lovely Maya...those cookie cutters are so cute and look what beauty they have created..I am in awe of these polvorons. Thank you, Raji. I hope you try out the polvoron recipe and experiment with your own flavorings! Wow, Maya, these are awesome! All of the flavours and colours are gorgeous and the Brangelina reference made me giggle. Looks like the little molds/plungers look perfect for them, even if that isn't exactly what they are made for! I am retweeting this for sure. Carolyn, I'm glad you picked up on that Brangelina thing ;-). Couldn't help myself...LOL. Thanks for the retweet, Mamma! Me, me, include me please. I want to make these adorable polvorons. Let's see, I already stalk you here. Pretty sure I'm stalking you on twitter, not sure what Pinterest is, but I guess I will go find out! Haha Gina, you're so endearingly cute! Bless you, girl. Get on Pinterest if you can, it's loads of fun! How beautiful! Love the flavor variations, too! Awesome. Glad you finally found the molds (or your ingenious version of them)!!! Yay! I love Filipino polvorons! Yours look really good, especially the raspberry ones. I'm scared at making macarons. I love eating them, but they're just scary little thing... delicious though. These polvorons look fab. The coconut/lavender one sounds utterly delicious. Those are just so beautiful! So elegant. I love the flavourings, too. Such pretty molds. Haven't seen anything like that before. How cute! What a great treat! They look very pretty. I've never tried polvoron but I can imagine the great flavour that milk powder will add. Oh what a brilliant find, they are too adorable and I adore your flavors. I so want to win one. Maya-Your polvorons are delightful! They are so pretty and I have never had them before. That first photo is stunning!Love the cute molds!! How pretty! So much fun. I've never seen anything like this before. I loe all the pretty flowers. Do you taste the milk powder in these little beauty ?! I feel like a stalker weirdo now. I just realized you were doing a giveaway :) I came back for a 2nd (or 3rd) look at the polvorons and figured I'd let you know I follow you on Twitter and I already stalk your feed! @sugar apothecary, haha, that's ok. You can come back as many times as you want! But since you mentioned it, you get 3 chances in the draw ;-). Pretty looking delicious little treats! I would love, love to try this.. I've tasted them before abroad, but my mind is all over the place with flavor ideas... do you know where I can find those molds? Those polvorons are very beautiful and mouthwatering, Maya. Can't wait to try them by myself. Anyway, I follow your twitter as @xipheyx and twitted about this giveaway. This is easy...I already follow you on Twitter. @elle marie, great to have you thinking about polvorons! Well, you know I bought my molds in Brunei, but I went online and found this link where you can order them: http://browncookie.com/shop/cookie-cutters-molds.html. Let me know if you do try some new flavors! Vero@xipheyx, thanks for retweeting this giveaway! Absolutely GORGEOUS! I've never heard of polvorons, but I think I would love them!! Trixie, I'm not sure what goofy taste is all about but I can imagine it's related to desserts, which you're not too keen on. Yes, polvoron could be one of the next big things...but first, let's make pull-apart bread the latest food superstar! LOL. Maya... these look so pretty! Actually I think I never heard of Polverons before... I don't make sweets, so maybe that's why... When I first saw these, I thought you made Japanese traditional sweets. Just soooo pretty. You are amazing. More awesome polvoron flavors! Maya you are so super talented, you know that? You should :) Your cookie cutter is adorable, gives the polvorones a fancy touch to them. Wow...these Polvorons are so cute and wonderful combination of flavors..came here via wild yeast blog and happy to come here. Ooh, thanks! Will try one next time I'm passing Fleur de Lys! Akheela@Torviewtoronto, so happy to link this post up with your event. Looks great, I see many links already! i have never seen such pretty polvorons! Hi may I know where did u bought your molder?it's cute. Thanx!